Some intern in the Governor’s office must have forgotten to remind officials of the New York Racing Association that Saratoga Racecourse was to open. Glitches occur on the first day of racing every summer. 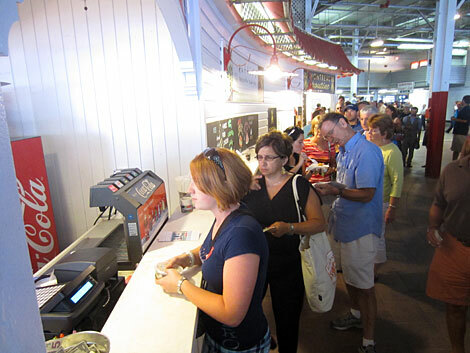 But this summer, NYRA’s operators neglected to turn the running water on in the toilets and the sound system on in half the clubhouse and throughout the entire grandstand. Even the new Wi-Fi system conked out. Saratoga was like Keeneland on the Hudson, before Keeneland put in a public address system to accommodate simulcasting. It was Belmont Park on Belmont Stakes Day, when about 100,000 fans came to see Big Brown attempt the Triple Crown and the ladies rooms went dry. Thank goodness the action was a distraction. A purse of $150,000 is a lot of money for non-winners of two races to run for. But that’s Saratoga offers these days. Five of the six 2-year-old fillies that went to the post in the grade III Schuylerville Stakes had only raced once. Can’t Explain, a New Jersey-bred filly that raced twice and won once before, finished second. The winner, Maggi Moss’s So Many Ways, ridden by red-hot Javier Castellano, was bred in Pennsylvania and broke her maiden at Parx. The projected duel between Jackson Bend and Caixa Eletronica never developed in the grade III James Marvin Stakes, ruining beaucoup Pick 6s. Pacific Ocean, a 5-year-old horse by Ghostzapper, gave jockey Joel Rosario, here from California, coincidentally, his second winner. Castellano, Ramon Dominguez and Rosie Napravnik rode two winners, too. Rosie’s more impressive winner was a $490,000 Stonestreet Stables acquisition named Kauai Katie by Malibu Moon, in the fifth. It’s been only a day, but it appears as if NYRA VP and Director of Hospitality Stephen Travers was right, after all, to move Hattie’s from the Clubhouse backyard to the Carousel. Lines were long for the fried chicken sandwiches. Some customers complained that Hattie’s had jumped up in prices a buck or two. At Siro’s on Restaurant Row, hummus on pita bread is $8 and a crab salad roll is $14. Inflation is affecting waistlines in more ways than one. Perhaps NYRA has upped its rent. It was fun to find the morning newspaper in the driveway wrapped in pink. Nick Kling, still portrayed by his Bar Mitzvah photo, is back with a detailed handicap. Four other guys pick their knowses, further maddening matters. You can disregard the lot, except for Bill Taylor. Year after year, Taylor selects more winners than anyone else in the Saratogian. He had only two on the opener. It was a dysfunctional afternoon, all around. 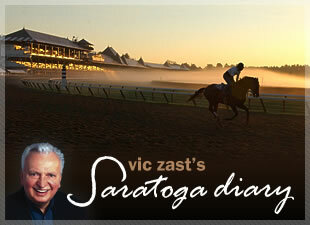 Vic Zast is the author of “The History and Art of 25 Travers.” He has attended the races in Saratoga for 47 straight years.